Project Unify athletes participate in a basketball skills clinic at Fontenelle Elementary. 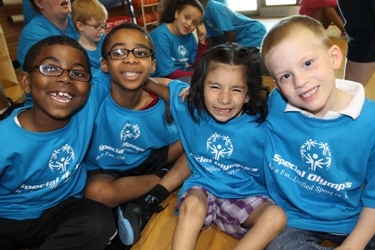 A U.S. National project, funded by the U.S. Department of Education, implemented to activate young people in schools and communities to create change- fostering respect, dignity, and advocacy for people with intellectual disabilities by utilizing programs and initiatives of Special Olympics. For more information about Special Olympics Nebraska's Unified Champion School program, contact Ben Feiten at bfeiten@sone.org or 402.331.5545x19.